Destin, Florida just might be where you'll find the Gulf Coast home of your dreams. 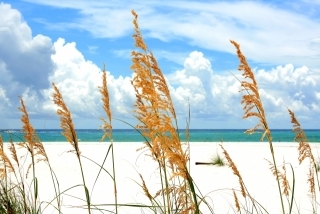 This thriving small city offers a wide variety of properties for all buyers, and Destin real estate includes everything from palatial waterfront mansions to neat little downtown bungalows. One will also discover a range of stunning Destin condos, and investors with a bargain in mind will find a selection of foreclosures and short sales. Steady growth in recent years has also given way to a variety of building styles. Destin home builders lead the nation in coastal residential development, with an emphasis on tall two and three story designs, Spanish-inspired tile roofing, and deeply set wrap-around decks. Destin homes come in a wide range of prices, starting in the low semi-luxury range and extending well into the millions. The finest Destin homes typically include amenities like custom pools, multiple patios, vaulted ceilings, and limestone floors, and are often professionally decorated with a bright Caribbean flair. Many Destin home owners are able to make extra income renting out part of their house to vacationers and seasonal residents. With more than three million tourists coming here every year, demand for rental property is always steady. If you would like to arrange a viewing, or require further information about Destin real estate and homes for sale, please contact Karrie Rose, or call (850) 830-9502.